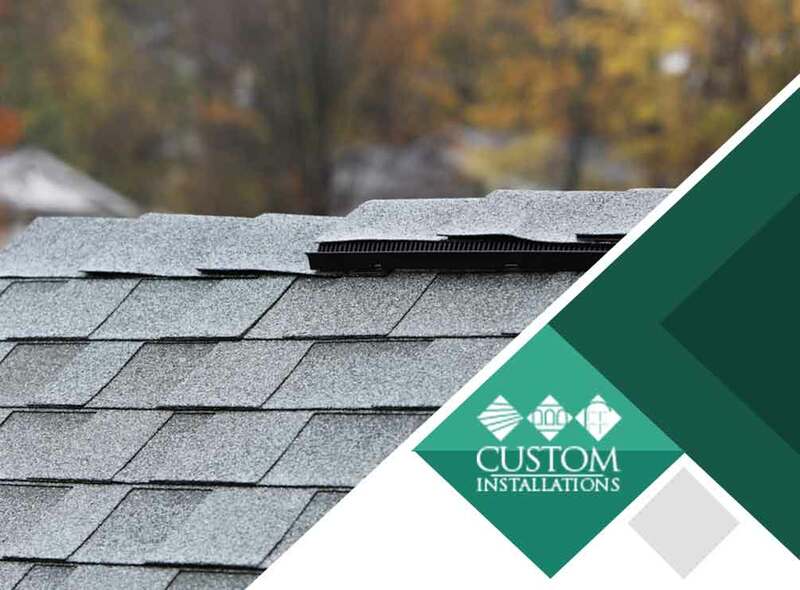 Here, Custom Installations presents the basic steps for roof replacement. We first ensure that your entire property is well protected every step of the project. This includes siding, walls, plants, bushes, etc. We lay out some drop cloths around the bottom of the roof to protect against any accidental drops. Roof jacks along the bottom of the roof holding 2×10 boards will catch slipping shingles and people. Custom Installations uses safety harnesses secured to the roof peak to prevent falls. Taking off the old roofing is a very important step in installing a new roof. We start at the top and work our way down dumping the removed shingles into the garbage. After the old roofing and underlayment is gone, we clear the bottom of your home of all debris. This will ensure easy access for our roofing services crew to install the new roof. The next step is a thorough inspection of the wood decking. We replace any soft, wet, or rotted wood to create a solid base for your roofing structure. This will help your shingles to stay intact. To ensure that wood sheeting is well secured to the roof rafters, we re-nail the whole wood decking. After completing the above steps, we lay out the new asphalt or metal roofing from the bottom up. Then we install step and counter flashing, ridge vents and ridge capping, as needed. But that doesn’t end there. We make sure to always be on hand for further services and maintenance because, just like your roof, we believe in the value of a lifetime commitment. We’ll be happy to discuss more details of our roof replacement process with you. We serve Highland Park, IL. Call us today at (847) 979-5522 for a free consultation.